Mixed grains topped with garlic shrimp, crispy brussels sprouts, dried cranberries, pomegranate arils, and crunchy chickpeas then drizzled with maple balsamic vinaigrette. 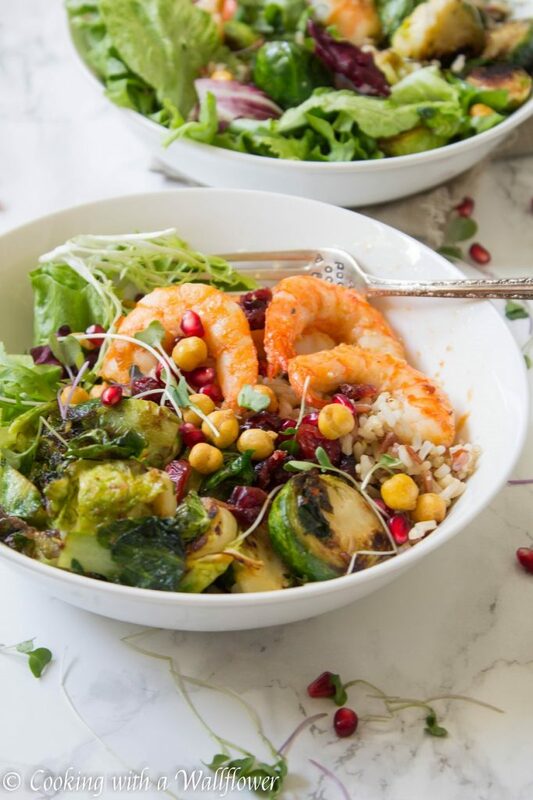 This garlic shrimp and crispy brussels sprouts grain bowl is delicious, simple to make, and perfect for a fall weeknight dinner. I feel like I’ve been on a roll these past few days with all the fall inspired dishes. There’s so many options to pick from: brussels sprouts, butternut squash, pomegranate, cranberries, maple everything. What are your favorite fall ingredients? I honestly think I can have bowl foods all day everyday and I wouldn’t get tired of it. Maybe it’s because the ingredients can be customized to your taste. So many ways to mix it up. I recently teamed up with Degusta Box for the holidays and they sent me a box of their snacks. Have you heard of them before? 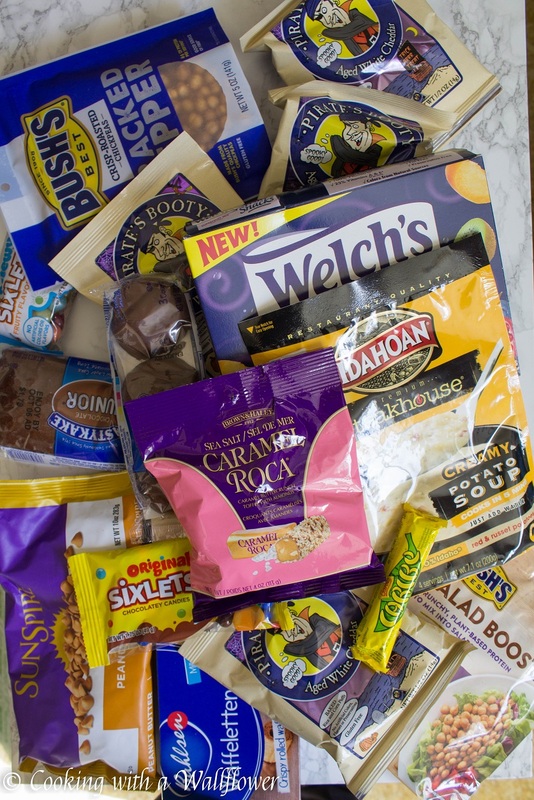 Degusta Box is a monthly subscription box that sends you a variety of snacks each month. I wasn’t sure what to expect, but I was surprised by all the snacks that were included. Especially snacks that are specially found on the East Coast. I was more than a little excited to see TastyKake as one of the items. I’ve been kind of craving some for awhile now since I got back from Philly in April. In the mean time, let’s talk about this grain bowl. 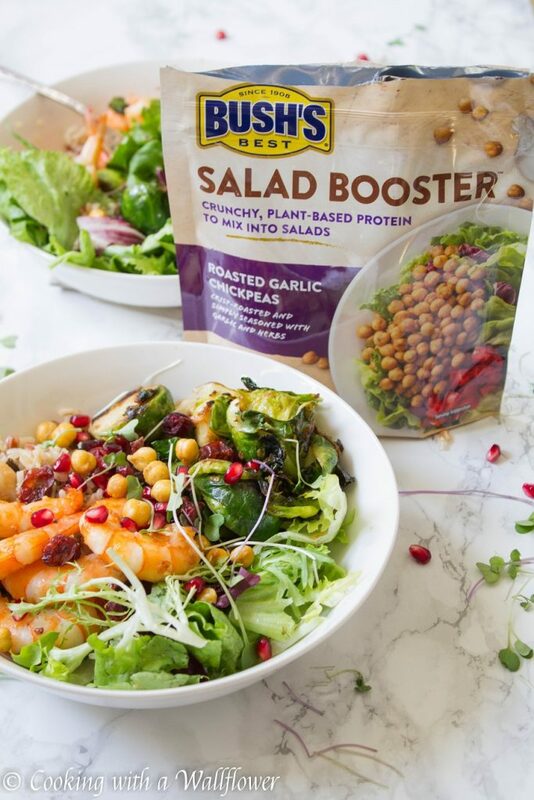 Mixed grains topped with garlic shrimp, crispy garlic brussels sprouts, mixed greens, tart pomegranate arils, sweet dried cranberries, microgreens, and crunchy roasted garlic chickpeas. Then to finish off the grain bowl, a drizzle of maple balsamic vinaigrette. So much flavor. So much texture. It’s my kind of fall dinner. In a medium sized skillet, add about a tablespoon of olive oil. Allow the olive oil to heat for a minute. Then add minced garlic and cook the garlic for a few minutes until browned and aromatic. 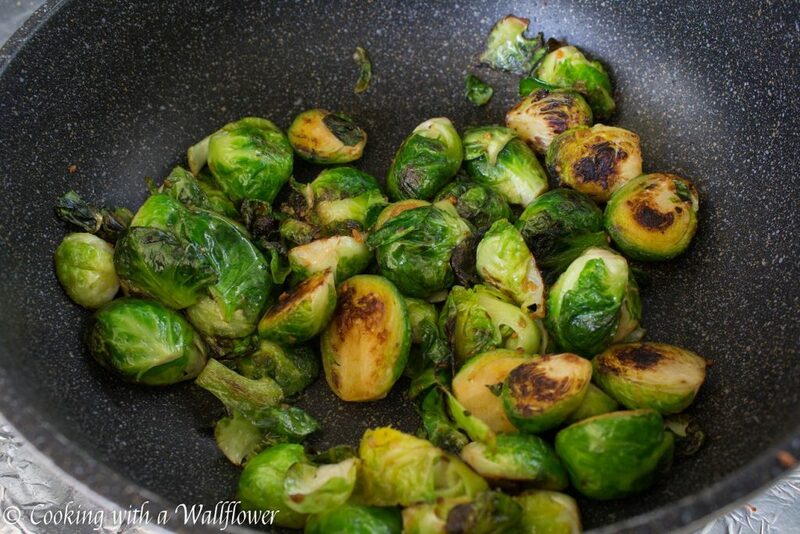 Add the brussels sprouts and cook for about 8-10 minutes until browned and crispy. Lightly season with salt. Set the brussels sprouts aside for now. In the same medium sized skillet, add olive oil and heat for about a minute before adding minced garlic. Cook the garlic for a few minutes until browned and aromatic. 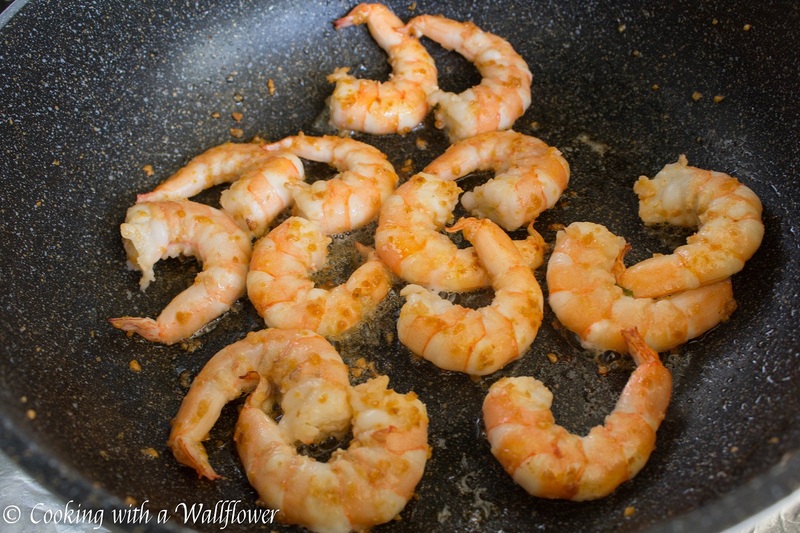 Next, add shrimp and cook until the shrimp turns reddish orange and no longer translucent. Lightly season the shrimp with salt. Set the shrimp aside for now. 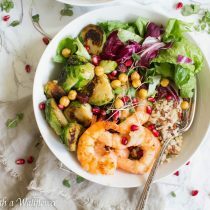 To make the grain bowl, add mixed grains. You can use whatever grains you like. 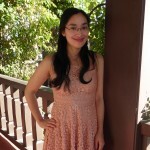 I had a mixture of wild rice, brown rice, and quinoa. 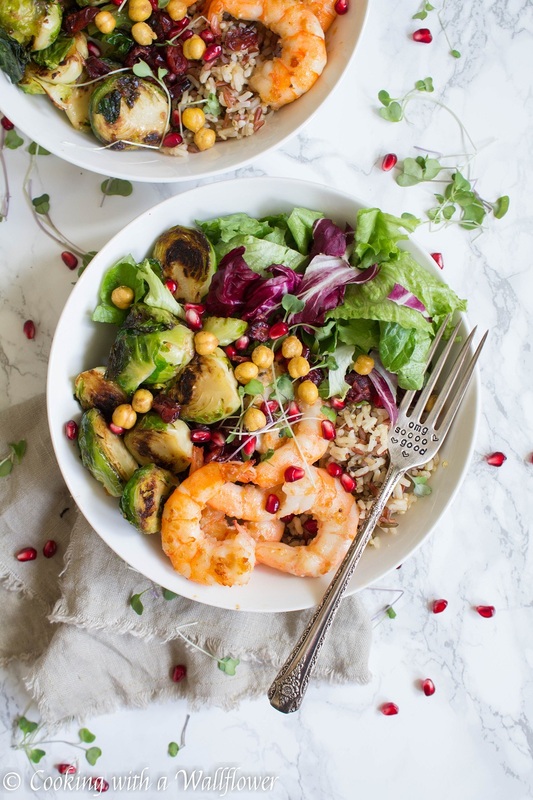 Add mixed greens, brussels sprouts, garlic shrimp, dried cranberries, pomegranate arils, and crispy chickpeas. 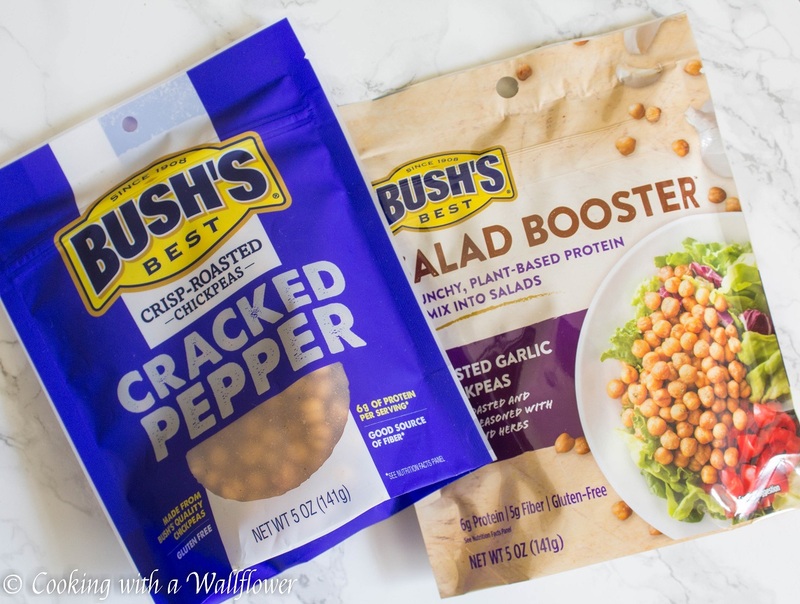 I used crispy chickpeas from the Degusta Box to add extra texture and flavor to my grain bowl. It’s more than a little addictive. In a small bowl, whisk together maple syrup, balsamic vinegar, and olive oil until combined. 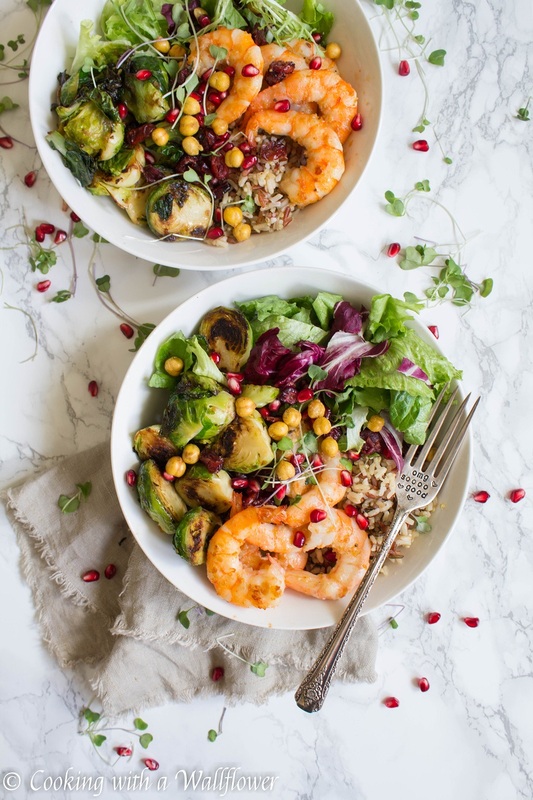 Serve this Garlic Shrimp and Crispy Brussels Sprouts Grain Bowl with Maple Balsamic Vinaigrette. To make the grain bowl, add mixed grains. 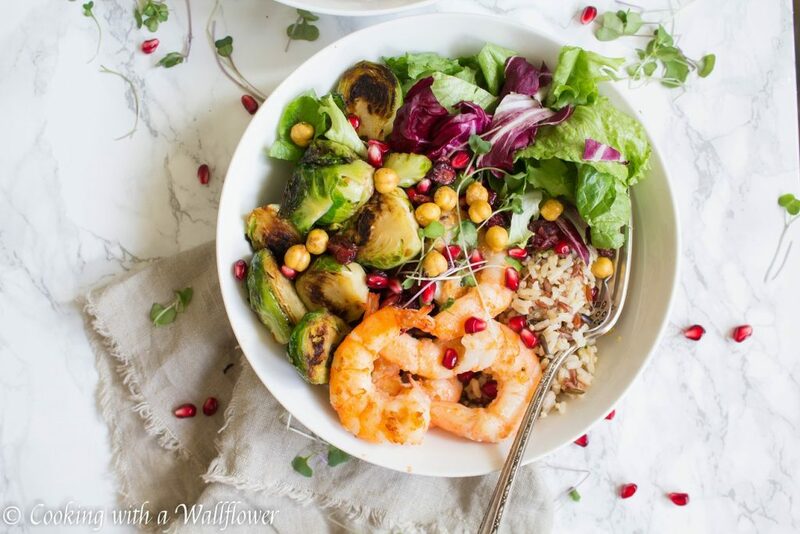 Add mixed greens, brussels sprouts, garlic shrimp, dried cranberries, pomegranate arils, and crispy chickpeas. 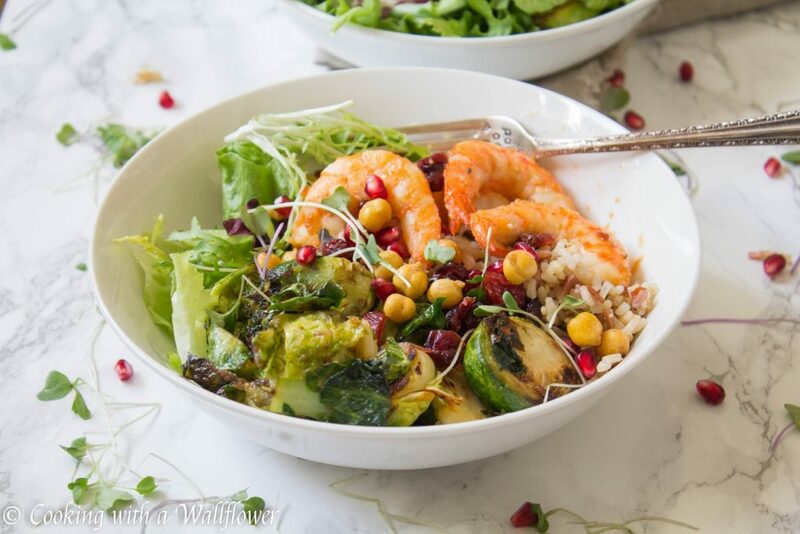 This entry was posted in Bowl Foods, Entree, Fall Cravings, Farmer's Market, Gluten Free, Grain Bowls, Healthy, Quick and Easy, Recipes and tagged bowl food, fall recipes, farmer's market, gluten free, grain bowl, quick and easy. I’m allergic to shrimp, but these do look delicious. This looks AND SOUNDS delish!!! 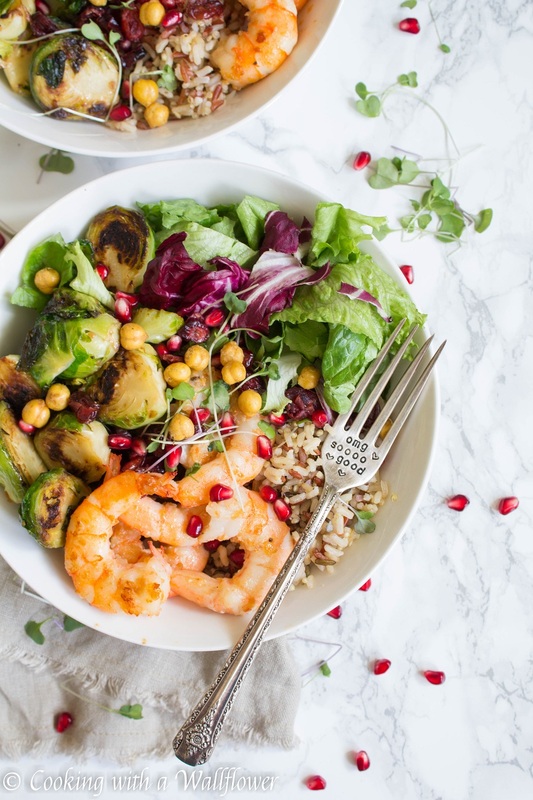 You had me at Garlic…Brussel Sprouts…Bowl! Thx for the recipe and the inspiration!! !